To say that the wedding plans are coming along nicely is an understatement. Short of getting out the invites, we have already knocked out several items on our list. We've found a venue that we like, talked table arrangements, menu and song for our first dance. Last night, I decided on the song for my Father/Daughter dance. I've started looking at creative and fun ways to ask my dearest friends to be a part of the bridal party and Doug has talked about gifts and ties for his attendants. A few days ago, I spent an hour with a girlfriend trying on wedding dresses and I found a few that I love -- one for my walk down the aisle and another for the rehearsal dinner. My mom, Doug's mom, Whitney, my sister and Taylor, my niece are all joining me for an afternoon of wedding dress shopping in a few weeks, so I can, without a doubt, find and ultimately wear the one that takes my breath away. When I went with my friend, I tried on a few that were "no way" and a couple that I really liked. Ok, a few that I LOVED. It's amazing -- that feeling when you put on a wedding dress and veil for the first time. Honestly, I thought I would go with a simple design, so I was surprised when I fell for one that had a lot of detail, a long train and a different cut then I had in mind. It's from BHLDN, a wedding shop found in select Anthropologie stores across the country. 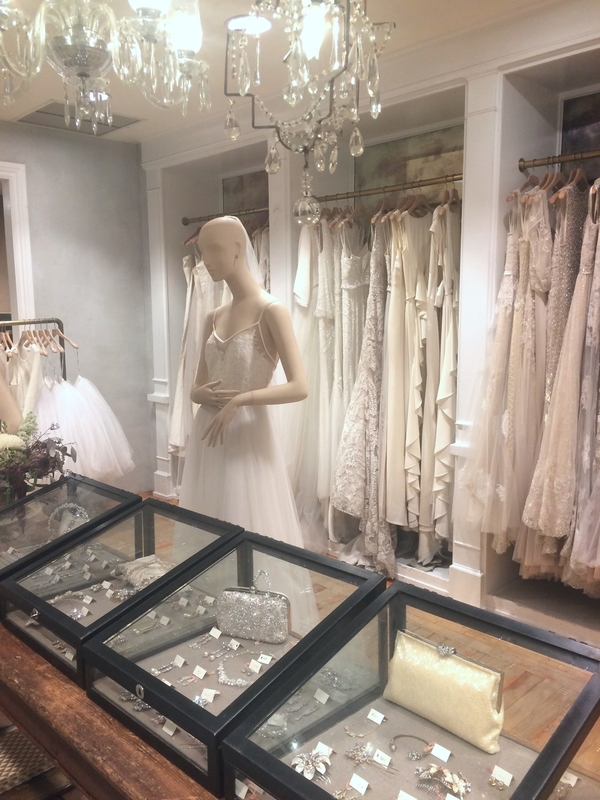 I love that we have one in Georgetown, DC -- making it easy to try on every dress in their incredible selection. I can't wait to wear it in a few months. Next up: how to accessorize it!